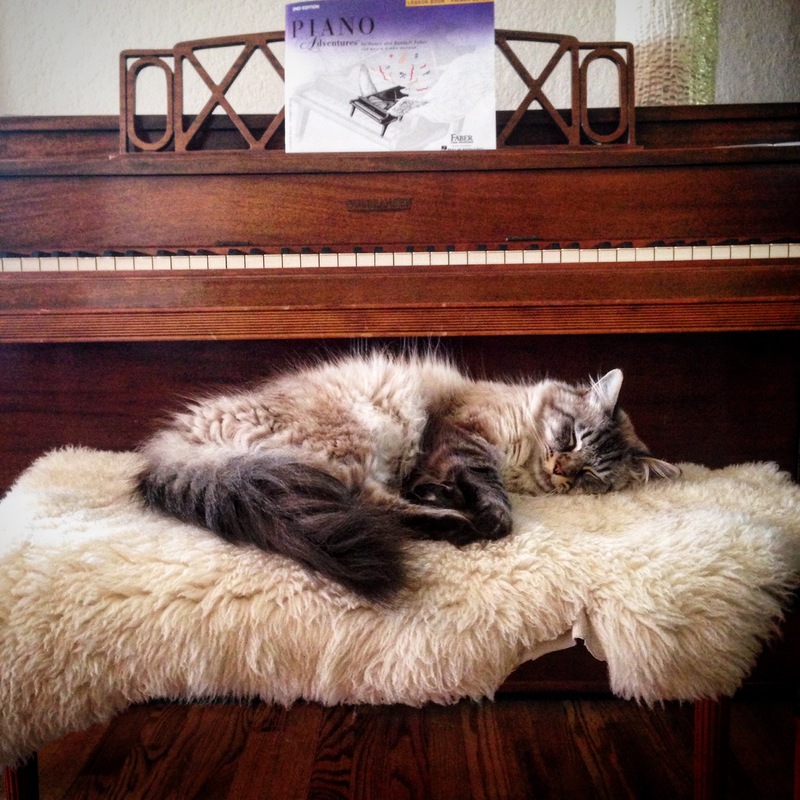 As a silly decorator – having a piano in the home thrills me almost as much for the design opportunity as for the music. It’s a gorgeous table top and art ledge rolled into a piece that is both functional, beautiful and musical. What to do with that lovely space above? For uprights – I prefer an asymmetrical decorating approach. They are the more casual pianos and not treated as preciously as baby grands and grands that take up a lot of space (and look amazing doing so). Grand pianos tend to have a more formal, luxurious look. Here’s a round up of a few styled “Spaces Above” that I like – I threw in one symmetrical look for those of you whose psyche’s need that. I put in a photo of my own piano at the end. For an easy asymmetrical arrangement, hang a large rectangular piece of art next to a smaller piece – you could even lean the smaller piece against the wall. I love the sculpture grouping on the right but could do without the dried flowers on the left – still it’s a lovely composition! The wood on the piano looks gorgeous surrounded by all white! I have quite a few symmetry loving clients out there – if this is you, a close grouping of framed prints with a pair of lamps looks fantastic! From Emily A. Clark. Another beautiful wood piano.. I like the flexibility of this arrangement a lot. Frame one larger piece of art and hang it about 5-6″ above the piano (centered). Then play with layering a few pieces of art on one side with something like a lamp, flowers or sculpture on the other side of the piano . This could also be styled symmetrically if you’re having a formal moment. Striking art! From Dear Lillie blog. Painting pianos was really in a few years ago – I’m not a fan unless the piano is really wrecked. This is a really pretty color and made even more feminine by the artful plate display above. If you want it to look more formal, a grid layout with matching plates would look nice too! For advice on hanging plates check out this how to from The Nester. 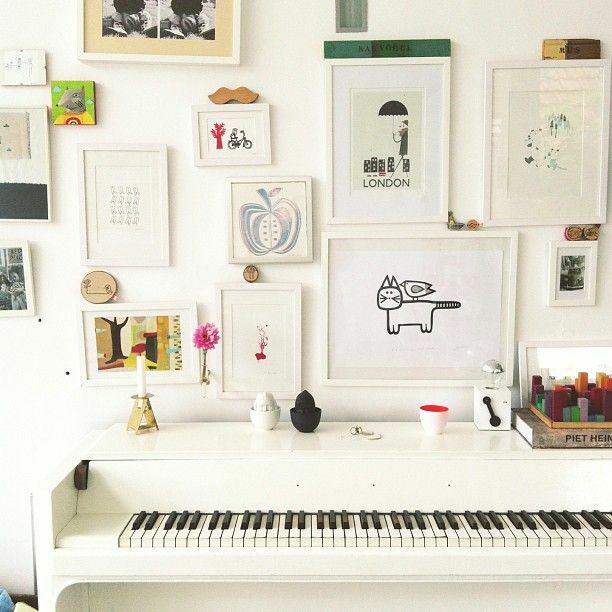 What a playful and creative gallery wall! If you’re up for something like this and are okay with lines not being straight or matched up – this would look awesome! I like the white frames and heavy white mats used to unify everything. Killer white piano too! Another take on the Gallery wall – this one is more even, less frenetic than the previous one. 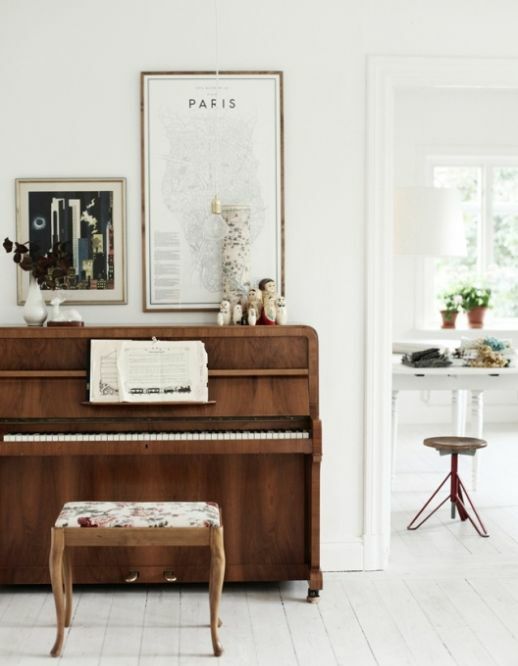 Lovely composition and an interesting choice for the piano bench! From Design Sponge. So adorable! I really like this – it’s young and stylish. The green wicker chair is pretty for the photo but not so practical for playing. A marquee sign lit up in the evening would look so lovely – great idea! Here’s a marquee sign shop on Etsy to get one for yourself – it would be fun to have something custom made. This is quite different and very intriguing. I know this isn’t for everybody, but a sculpture grouping or a collection grouping of some kind is great for a piano top! From Lotta Agaton’s home. This is similar to the one above in that it showcases a collection. 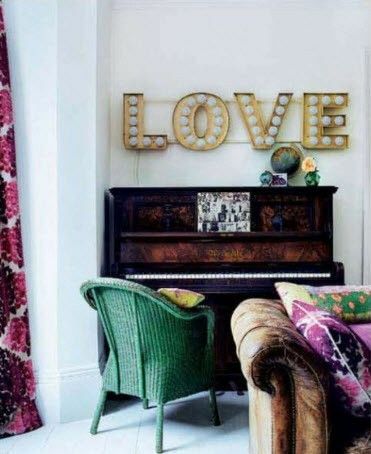 I’d love to see a collection of antique mirrors above a piano too! From Design Sponge. This one makes me laugh – so it had to be included. 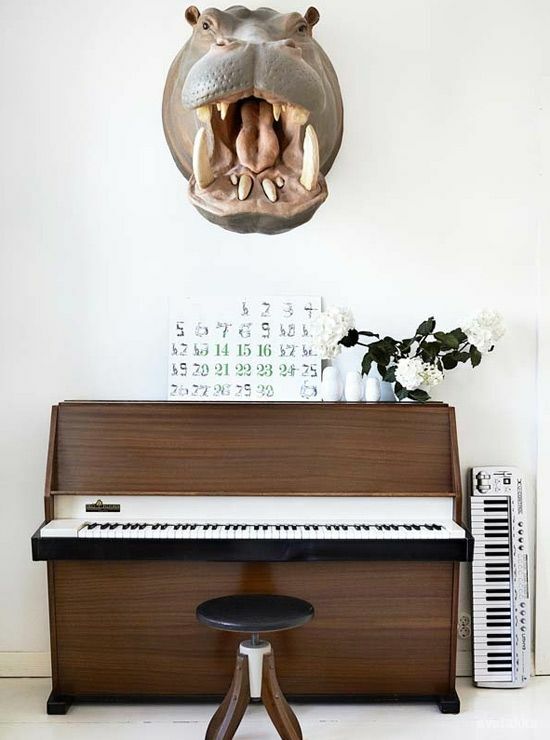 Just a reminder to not take decorating too seriously and hopefully, that’s not a real hippo head. Found on Desire to Inspire. 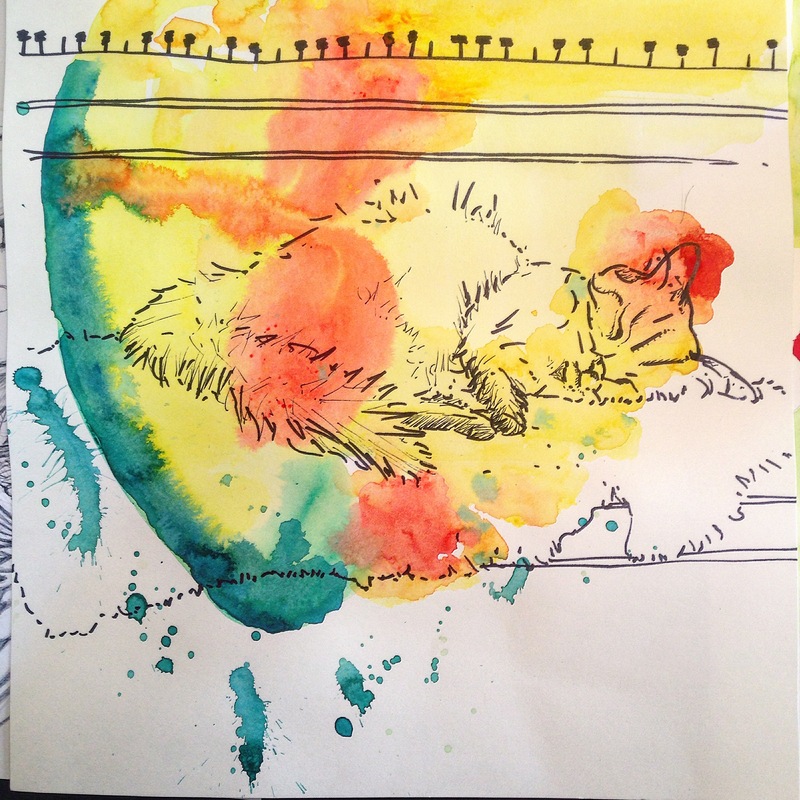 Here’s a watercolor and sharpie I did of Honey on the seat with the piano keys – should’ve named him Schroder. Really enjoyed this blog! Even seeing/hearing Tori again…such talent and beautiful to boot. Now I need a piano! What strikes me about all these photos is that none of these pianos have a piano lamp on them. Anyone who actually plays their piano and reads music (like me) will probably have one. My piano is only 36″ high, but the lamp sitting in the middle adds 15″ (or it will be blocking the painting I want to hang over the piano). But if I place the painting all the way above the lamp it seems too high . . . so I’m trying to figure out the right placement. Nice pics though . . . just not solving my dilemma. Any thoughts? I have a wall sconce to the left of my piano. It has a swing arm and works perfectly. I used to have a lamp but it took up a lot of space and just got dusty. :). I agree on light being necessary! I think perhaps some of the folks in the photo don’t play…. I hate sconces so will stick with my lamp 🙂 I ended up hanging the painting so that the bottom is a couple of inches higher than the lamp. It looks fine. And once I put a few family photo frames on the piano things will all flow together. Thanks for the ideas! I have an antique very tall upright and struggling what to put over it as well as on either side on the floor. HI Laurie, those tall uprights are gorgeous! You can always soften it up with a plant next to it or even an antique dining chair that you set piano music on….Over it does depend on the style of the room though…. I have a very plain brown piano we bought in the 80’s that lacks charm. Do to lack of space in our house, has to be on the focal wall. I’m having a hard time figuring out how to decorate the top and the wall space above it. The wall it is on is 18 feet tall. Any ideas would be welcomed! You can always do a little gallery wall above it, or a grid of art above if you’re not into asymmetry. Add some lamps or one lamp and try to bring that wall down a little to cozy up the piano. 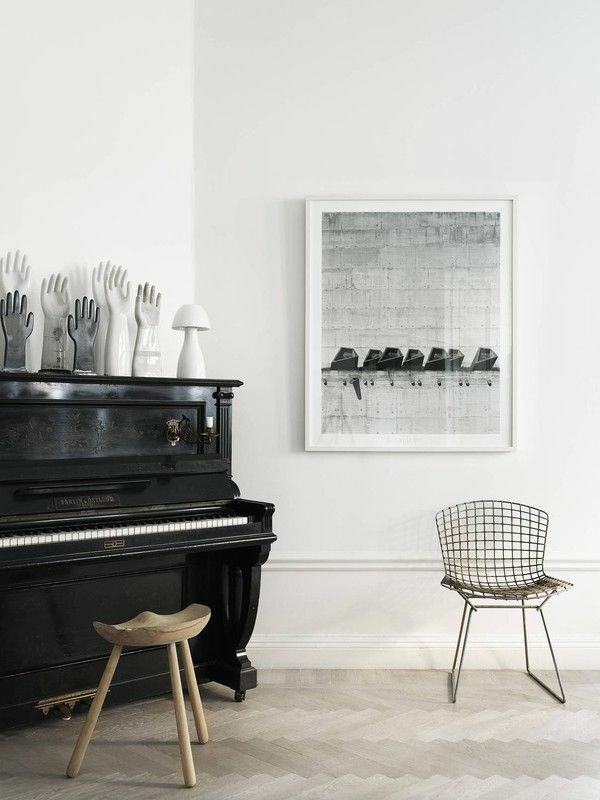 If you’re into a statement piece, you could try one large piece of art, but it might dwarf the piano. Good luck! !